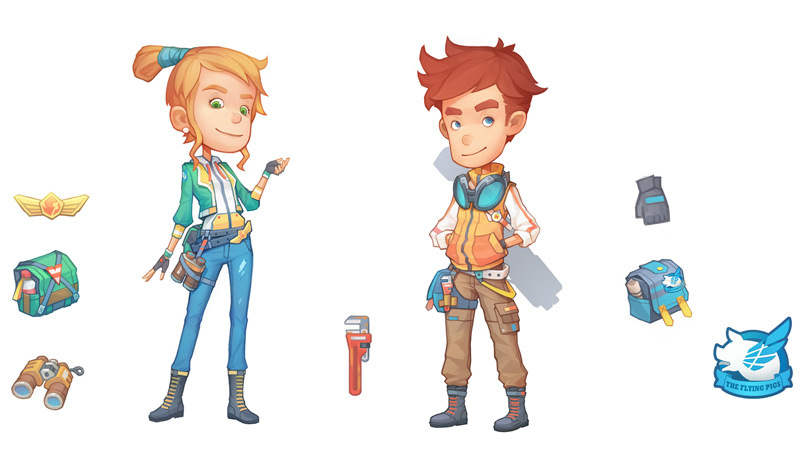 So, I've been working on this project with a small team since Planet Explorers development neared its end. It's been in the works for about a little over a year now. Probably should have started a thread a lot sooner, but whatever, better late than never. Since we worked on a pretty big project before, it'd be easy to assume we know exactly what we're doing...NOT AT ALL. This project went from a casual RPG to a story RPG to a flying RPG to an ARPG back to a casual simulation RPG. But I think we finally got the hang of it, the lastest versions have been pretty fun to play. The world is set in a post-apocalypse setting, or something like 1000 years after the event. Humans are few and relics from the past are everywhere. 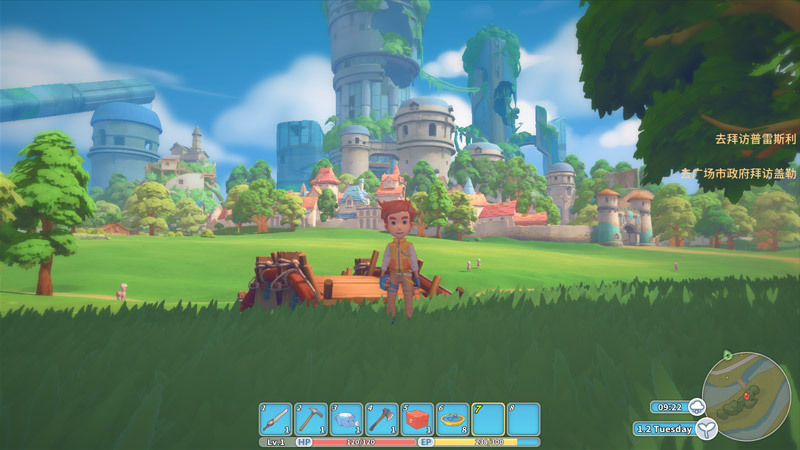 The player is trying to start a new life in a town on the edge of civilization called Portia. He/she will start a workshop and build things with relics from the past. We want to really enrich the world with other NPCs that have their unique behaviors. We also kept some voxel digging gameplayer leftover from Planet Explorers for the dungeons. When we started this project, we wanted to make something like Animal Crossing mixed with Dark Cloud 2 mixed with Steambot Chronicles, since the release of Stardew Valley, probably add that in as well. We want to incorporate a lot of what made these games fun but also keep our own identity. 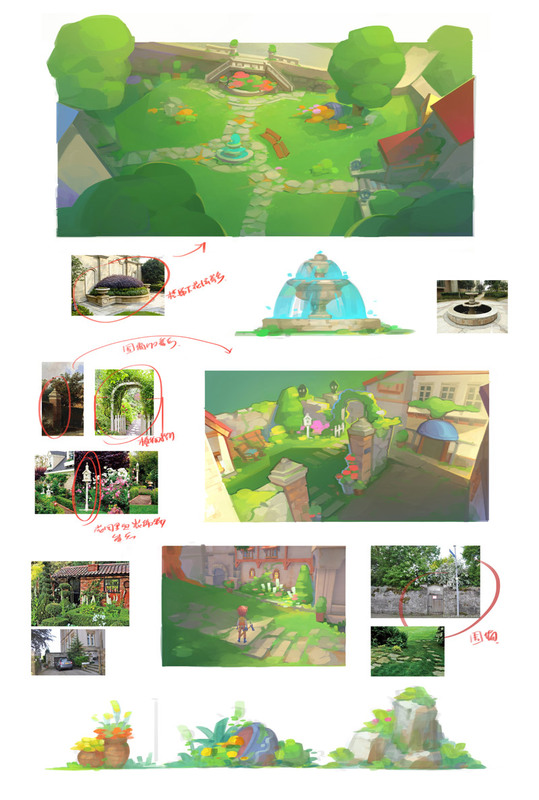 For the art, I wanted a very warm and welcoming world, somewhat cartoony. We want to release this game on Early Access later this year. I'll be posting our past and current issues later. Back to work for now! For the art style you are going for, I think the shaders and art in general is superb! It follows a theme, and is looking good. Wow! I agree with above the art style and shaders look phenomenal! Looking good! Thanks! We're still working on the lighting and weather systems. We're aiming for full seasons and day cycle, so tweaking lighting is a never ending battle. We'll probably add in a distance shader that shades the side of model that's facing away from the sunlight, so we can cut down on shadow distance. When making an open world game, the biggest problem still comes back to efficiency, it's really hard to maintain a stable framerate. Visually this game is a joy to look at! My Site - My Twitter - *GASP* MY SPINACH PUFFS! Like I mentioned before, this game used to be a more traditional RPG, so the world map had many, many locations. Pretty soon (like within a week) it became obvious that we just didn't have the manpower for it. 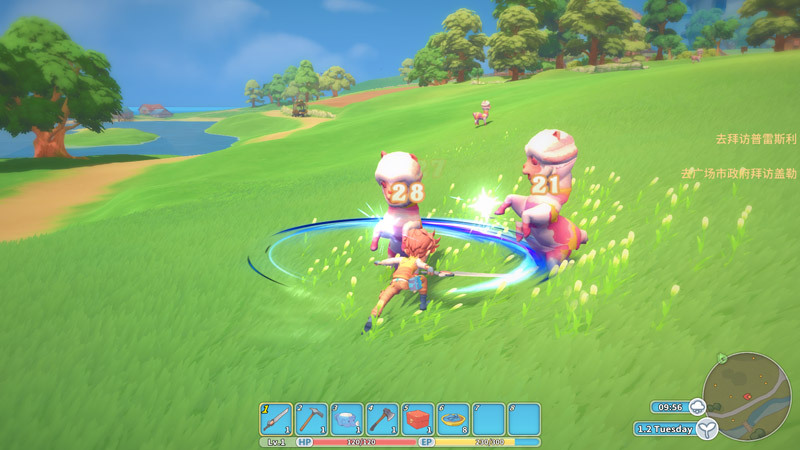 So in the end, we decided to have the entire game take place around the town of Portia. There are dungeons and new areas to unlock and probably a bus ride to other locations down the line, but the focus would be to make a 2X2km map as pretty as we can. We spend a lot of time trying to come up with the location design, we wanted the tall building ruins, the rolling hills with farms, a river, a cliff, a lake, and a port (for obvious reasons). For the town itself, we took a look at Future Boy Conan and Laputa, as well as Swiss and French cottages. Since the people of this world get a lot of their everyday raw materials from the ruins, we added elements of metal and technology to the town. So we ended up with a not-quite-steampunk-but-halfway-there town. The overall world is very green and lush due to the lack of man, so we wanted the buildings to stand out among the green by giving them mostly blue and red based hues. This looks so good. I almost mistook the first in-game screenshot for concept art. Very good and very inspiring! For the last couple of days, I've been working on finalizing all the zones on our world map. Our map is only 2X2km, so if the player is to run from one end to the other none-stop, it'd be over really quickly. Our goal is to split the map into sections and unlock the locations through leveling up, completing missions, or getting friendlier with NPCs. This way, the player will always have something new to discover just as he/she gets settled into a routine. 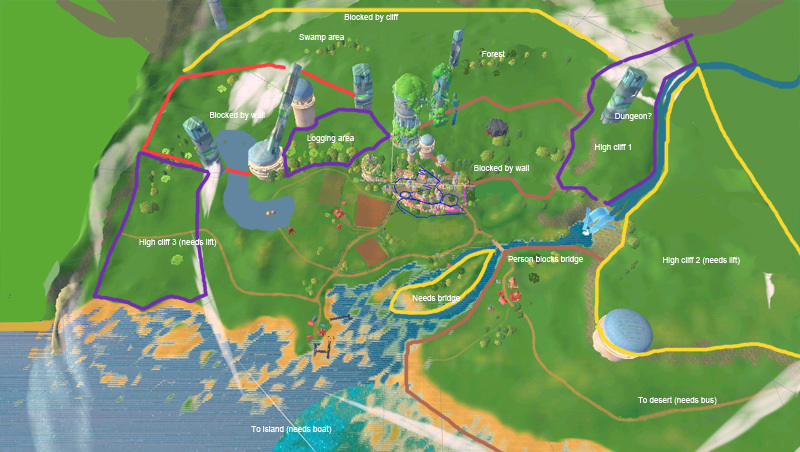 The plan is if we run out of areas to ensure fulfilling gameplay for the duration of the 3 years of in game time, we'll just add new towns that the player can get to on buses or boats (as seen below). We've been designing the logo the last few days, I wanted an old scripted look with a focus on Portia. 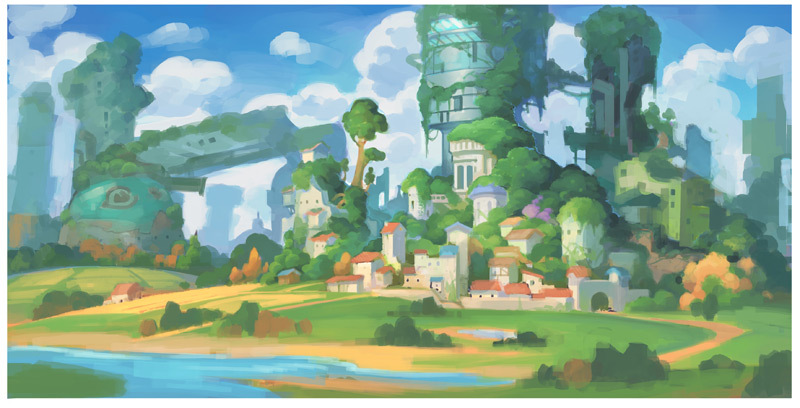 Cool art style, always love the idea of more simulation oriented games in fantasy like settings. Curious how you're handling the map. Is it going to stream in those different areas or are they loaded at portals? 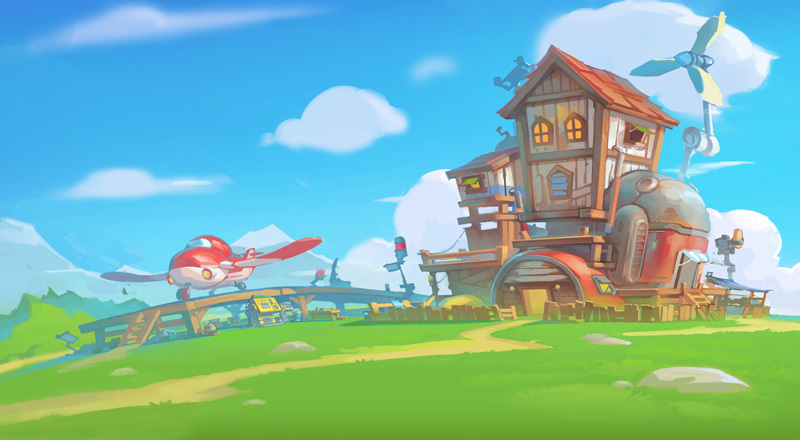 Nice logo and nice art in the game ! Wow, this looks pretty great. Loving the bright, colorful graphics, and I'm a huge fan of DC2 and Steambot Chronicles! AC also has its appeal - it all could work well together, though those are a lot of holes to fill! Anyway, nice work so far! Thanks everyone! We have very strict rules on what the saturation level should be at, then we use the fog color to unify the scene. We are still looking at the lighting model as we're still not very happy with it, in a lot of places it's still very flat. We look at Zelda and go "man, we want that!" We're still discussing how exactly we'll do the different zones. We want to have no loading, letting the LOD coding do their work, stream in assets when needed and turning off assets when far away. But Unity is really bad at streaming in stuff, there's always a notable stutter for anything larger than simple models or effects, mostly caused by the harddrive bandwidth. We're trying to see if we can preload assets in the background. The other option is to do area loading, like loading into a room, in which you turn on the best models and ai inside the room and turn them off outside of it. This will probably be decided soon. Haha, tell me about it. Basically we're trying to do dungeon combat, player personal workshop/farm, building, NPC interactions, and story events all in one! I think we just like to get ourselves into tricky situations and figure things out from there. Too bad Irem doesn't exist anymore, I so want a Steambot 2. Nice and refreshing art style! I personally like the in-game graphics even better than the concept art. For the past week, we've been working on nailing down the leveling up process. The last demo we had, the story was the main driver in getting the player to do what's next, but the moment we ran low of missions, people didn't know what to do and lost focus. From the demo, we understood it as we need to have a complete cycle outside the missions that can drive a player to gather, make, sell, then spend the money to gather and make more. Right now, we think that the gathering part of the game doesn't have the depth for players to spend their money on, thus cutting off the cycle. So that's our focus for this week. We're hoping to put out a demo on June 5th and see how players judge our direction.